Aquarius constellation is located in the southern hemisphere. It is one of the 12 zodiac constellations. The constellation’s name means “the water-bearer” (or “cup-bearer”) in Latin and its symbol is ♒, which represents water. Aquarius lies in the region of the sky which is sometimes referred to as the Sea, because it contains a number of other constellations with names associated with water; Pisces (the fish), Eridanus (the river), and Cetus (the whale), among others. Like other zodiac constellations, Aquarius was catalogued by the Greek astronomer Ptolemy in the 2nd century. Aquarius contains the famous supergiant star Sadalsuud (Beta Aquarii) and a number of notable deep sky objects: the globular clusters Messier 2 and Messier 72, the asterism Messier 73, the Aquarius Dwarf Galaxy, Atoms for Peace Galaxy (NGC 7252) and two well-known nebulae: the Saturn Nebula and the Helix Nebula. Aquarius is the 10th largest constellation in the sky, occupying an area of 980 square degrees. It is located in the fourth quadrant of the southern hemisphere (SQ4) and can be seen at latitudes between +65° and -90°. The neighboring constellations are Aquila, Capricornus, Cetus, Delphinus, Equuleus, Pegasus, Pisces, Piscis Austrinus, and Sculptor. Aquarius contains two stars brighter than magnitude 3.00 and seven stars that are located within 10 parsecs (32.6 light years) of Earth. The brightest star in the constellation is Beta Aquarii, also known as Sadalsuud, with an apparent magnitude of 2.87. The nearest star is EZ Aquarii, a triple star system composed of three M-type dwarfs, located at a distance of 11.27 light years from Earth. Aquarius has a considerable number of stars with known exoplanets. These are Psi-1 Aquarii (91 Aquarii, spectral class K0III), HD 210277 (G0V), HD 212771 (G8IV), HD 222582 (G5), HD 220689 (G3V), HD 215152 (K0, two planets), HD 206610 (K0III), WASP-69 (K5), WASP-70 A (G4), WASP-75 (F9), Gliese 849 (M3.5, two planets), Gliese 876 (M3.5V, four planets), WASP-47 (G9V, four planets), and WASP-6 (G8). Aquarius belongs to the Zodiac family of constellations, along with Aries, Taurus, Gemini, Cancer, Leo, Virgo, Libra, Scorpius, Sagittarius, Capricornus, and Pisces. Aquarius contains three Messier objects: Messier 2 (NGC 7089), Messier 72 (NGC 6981), and Messier 73 (NGC 6994). There are four meteor showers associated with the constellation: the March Aquariids, Eta Aquariids, Delta Aquariids, and Iota Aquariids. Sadalsuud is the brightest star in Aquarius. It belongs to a rare class of stars, the yellow supergiants. It has an apparent magnitude of 2.87 and is approximately 540 light years distant. Its name comes from the Arabic phrase sa’d al-suud, meaning the “luck of lucks.” Beta Aquarii has also sometimes been referred to as Lucida Fortunae Fortunarum, which is Latin for the “brightest luck of lucks.” The star is associated with the spring and the good fortune brought by the Sun when it rises after winter has passed. Sadalsuud has a mass that is six times that of the Sun and is 2,200 times more luminous than the Sun. It is a triple or multiple star. The primary component, Beta Aquarii A, has two optical components, one with a magnitude of 11.0, lying 35.4 arc seconds away, and another with a magnitude of 11.6, 57.2 arc seconds away. Sadalmelik is a G-type (yellow) supergiant, approximately 800 light years distant. It is 3000 times more luminous than the Sun and has an apparent magnitude of 2.950. Its name is derived from the Arabic phrase sa’d al-malik, which means “luck of the king.” Sometimes the star is also called Rucbah, a name it shares with Delta Cassiopeiae. Skat, Delta Aquarii, shares its traditional name with Beta Pegasi (Scheat). The name is derived from the Arabic as-saq, which means leg or shin. Skat is the third brightest star in Aquarius. It is believed to be a member of the Ursa Major Moving Group (Collinder 285), an association of stars that includes the most prominent stars of Ursa Major, which share common velocities and origin. The star has an apparent magnitude of 3.269 and is approximately 160 light years distant. Delta Aquarii is associated with a meteor shower, the Delta Aquariids. The Southern Delta Aquariids shower is visible from mid-July to mid-August, it peaks on July 28 or 29, and has an average meteor observation rate of 15-20 per hour, while the Northern Delta Aquariids last from July 16 to September 10 and peak in mid-August with an average rate of 10 meteors per hour. Sadachbia, Gamma Aquarii, has an apparent magnitude of 3.84 and is 158 light years distant. Its name is derived from the Arabic phrase sa’d al-axbiyah, which means “luck of the homes” (tents). Gamma Aquarii is a spectroscopic binary star with a period of 58.1 days. Sadaltager, Zeta Aquarii, is another binary star, located at the centre of the water jar asterism. It has an apparent magnitude of 4.42 and is 103 light years distant. Its name comes from the Arabic expression sa’d al-tajir, which means “luck of the merchant.” Sometimes it is also called Altager, another variant of the same name. The brighter component, Zeta-2 Aquarii, is a yellow-white F-type main sequence dwarf, while the companion, Zeta-1 Aquarii, is a yellow-white F-type subgiant. The pair is easy to resolve, as the stars are almost equally bright. Zeta-1 Aquarii has a visual magnitude of 4.59 and Zeta-2, of 4.42. R Aquarii is notable for being a symbiotic star. It is a binary star, believed to consist of a white dwarf and a red giant that is a Mira-type variable star. The white dwarf’s gravitational pull draws in material from the red giant and sometimes ejects the surplus, which forms a nebula around the system. The nebula is known as Cederblad 211. R Aquarii has an apparent magnitude of 7.69 and is approximately 600 light years distant. 91 Aquarii, or ψ1 Aquarii (Psi-1 Aquarii) is the brightest component in a triple star system that lies about 148 light years away. The primary star is an orange giant with an apparent magnitude of 4.22 that has a confirmed extrasolar planet in its orbit, discovered in 2003. The companion is another binary star, composed of two magnitude 10 stars. The planet orbiting the primary is called 91 Aquarii b or HD 219449 b. It orbits the star at the average distance of 48.5 Gm, which is shorter than the distance between the Sun and Mercury (57.9 Gm). Gliese 849 is a red dwarf, 29 light years distant. The star has a Jupiter-like planet, Gliese 849 b, orbiting it at a distance of 2.35 AU. The planet was discovered in August 2006. It was the first long-period Jupiter-like planet discovered orbiting a red dwarf. Gliese 876 is another red dwarf, only about 15 light years distant. The star is very faint, though, and with an apparent magnitude of 10.1, it cannot be seen by the naked eye despite its proximity. In 2010, it has been confirmed that Gliese 876 has four extrasolar planets in its orbit. The planet closest to the star is believed to be either a small Neptune-like planet or a large terrestrial one. The middle planets are similar to Jupiter. The outer planet is close to Uranus in terms of mass. The orbits of the outer three planets are locked in a Laplace resonance, with a simple integer ratio (1:2:4) between their orbital periods, like Jupiter’s moons Ganymede, Europa and Io (also in a 1:2:4 orbital resonance). 88 Aquarii is an orange K-type giant, approximately 243 light years distant. It has an apparent magnitude of 3.68.
λ Aquarii (Lambda Aquarii) has the traditional names Hydor and Ekkhysis, which mean water and outpouring in ancient Greek. The star in an M-type red giant, about 392 light years away. It is an irregular variable star with a mean apparent magnitude of 3.73.
ε Aquarii (Epsilon Aquarii) has traditional names Albali (“the swallower” in Arabic) and Nir Saad Bula (“the brightest luck of the swallower”). It has an apparent magnitude of 3.8 and is 215 light years distant. It is a white subgiant and a suspected variable. M2 is a globular cluster located five degrees north of Sadalsuud (Beta Aquarii). It is 13 billion years old and contains about 150,000 stars, including 21 known variables. With a diameter spanning 175 light years, it is one of the largest globular clusters known. M2 is approximately 37,500 light years distant and has an apparent magnitude of 6.3. The brightest stars in the cluster, mostly red and yellow giants, have a magnitude of 13.1. M2 was discovered by the Italian astronomer Jean-Dominique Maraldi (Giovanni Domenico Maraldi) in 1746 while he and Jacques Cassini were observing a comet. Charles Messier discovered the cluster in 1760, but believed it to be a nebula. German astronomer William Herschel was the first to resolve the stars in the cluster in 1783. Messier 72 is also a globular cluster, approximately 53,000 light years distant. It lies well beyond the Galactic Centre. It is about 106 light years in diameter and has an apparent magnitude of 9.3. It contains several blue giant stars and is considered to be a young cluster. It also has a significant number of variable stars, 42 known ones, mostly RR Lyrae type. The brightest star in the cluster has an apparent magnitude of 14.2. M72 was discovered by the French astronomer Pierre Méchain in 1780. Both he and Charles Messier, who included the cluster in his catalogue, believed the object to be a faint nebula. The cluster is not an easy one to observe. In a 10-inch telescope, it appears only as a faint patch. The stars can, however, be resolved in a 20-inch telescope. M72 is located three degrees to the south and 1.5 degrees east of Epsilon Aquarii, or nine degrees east of Algiedi (Alpha Capricorni). Messier 73 is an asterism of four stars that appear close to each other in the night sky, but are really not connected. The asterism used to be treated as a sparse open cluster until 2002, when an analysis proved that the six brightest stars in the ‘cluster’ were not only at very different distances from Earth, but also that they were moving in different directions. Charles Messier discovered the object in 1780 and described as a cluster of four stars with some nebulosity. English astronomer John Herschel was not entirely convinced that M73 was a cluster, but included it in his General Catalogue of clusters, nebulae, and galaxies. M73 is located 1.5 degrees east of M72. The cluster is approximately 2,500 light years distant. The Saturn Nebula was discovered by Sir William Herschel in the late 18th century. It got its name from the English astronomer and telescope maker William Parsons, 3rd Earl of Rosse, in the 19th century. In larger telescopes, its shape appears similar to that of the planet Saturn. The nebula is located a degree to the west of Nu Aquarii. The Saturn Nebula is a planetary nebula that formed when a low-mass star evolved into a bright white dwarf. The central star has a luminosity of about 20 Suns and an apparent magnitude of 11.5. Its temperature is about 55,000 K.
The star emits strong ultraviolet radiation, which is believed to create the nebula’s fluorescent green tint. The Helix Nebula was discovered by the German astronomer Karl Ludwig Harding in the 19th century. It is a large planetary nebula, one of the closest bright nebulae to Earth. It is approximately 700 light years distant. Because of its appearance, the nebula has earned the nickname the Eye of God. The nebula is 2.5 light years in span. The remnant stellar core at the nebula’s centre (planetary nebula nucleus or PNN) will eventually become a white dwarf star. 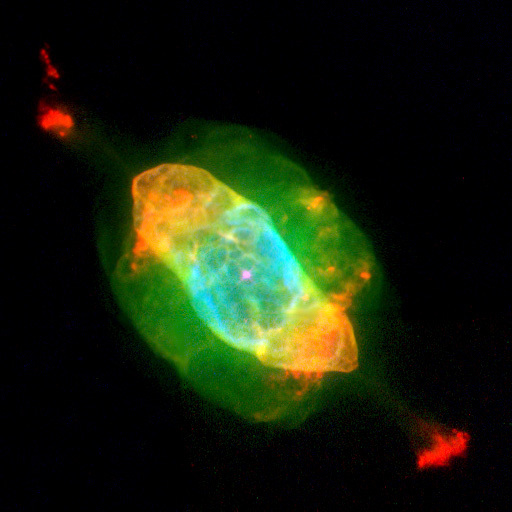 Helix was the first planetary nebula discovered that has knots of nebulosity. It is located a degree to the west of Upsilon Aquarii. In small telescopes, it appears as a faint patch of light, but bigger ones (6-inch) will reveal a dark centre with a star. The Aquarius Dwarf is an irregular dwarf galaxy and a member of the Local Group of galaxies. It is approximately 3.1 million light years distant and has an apparent magnitude of 14.0. The Aquarius Dwarf is one of the rare galaxies that display a blueshift; it is moving toward the Milky Way Galaxy at 137 km/s. Atoms for Peace Galaxy, catalogued as NGC 7252, is a peculiar elliptical galaxy, approximately 220 million light years distant. It is believed to be the product of a collision between two disk galaxies roughly a billion years ago. The galaxy’s central region contains more than 500 ultra-luminous clusters. The clusters have hot bluish stars and are estimated to be relatively young (50 – 500 million years old). Deep inside NGC 7252, there is a pinwheel-shaped disk, appearing like a face-on spiral but only 10,000 light years across, rotating in the direction opposite to the rest of the galaxy. It is believed to be a remnant of the merger between two galaxies. NGC 7727 is a peculiar spiral galaxy (SAB(s)a pec) located at a distance of 76 million light years from Earth. It has an apparent magnitude of 11.5 and occupies an area 4.7′ by 3.5′ in size. The galaxy’s disturbed appearance, which is likely the result of a merger of two spiral galaxies about 1 billion years ago, has led to its inclusion in Halton Arp’s Atlas of Peculiar Galaxies as Arp 222. NGC 7727 will likely become an elliptical galaxy in the future. Other notable deep sky objects in Aquarius include the peculiar galaxy NGC 7257, lenticular galaxy NGC 7759, elliptical galaxy NGC 7600, the galaxy cluster Abell 2597, located about 1 billion light years from Earth, and SSA22-HCM1, an extremely luminous galaxy located at a distance of 12.66 billion light years, with an apparent magnitude of 26.6.